This is North America’s smallest dabbling duck. The brightly patterned drake has a green and reddish head and a white stripe along the shoulder. Their speculum is greenish towards the inner wing and black towards the outer wing. Early fall drakes are usually still in full eclipse plumage. 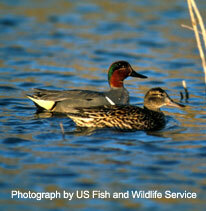 Green-winged teal have an average length of 15 inches and an average weight of 14 ounces. 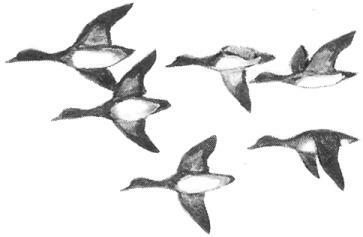 They nest as far north as Alaska, and migrate in all four flyways. They are a common winter resident in South Carolina. Quite hardy—some birds stay as far north as open water is found. They nest as far north as Alaska, and migrate in all four flyways. 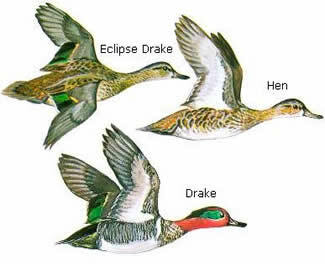 Early fall drakes are usually still in full eclipse plumage. Green-winged teal are opportunistic foragers, consuming a wide variety of seeds, aquatic insects, mollusks, and crustaceans. Pair bonds are formed on the wintering grounds. The hen builds the nest in sedge meadows, grasslands, and brush thickets in close proximity to water. She scrapes a nest bowl into the ground and pulls surrounding vegetation around nest bowl. Here she lays 6-9 creamy white to buff eggs. Drakes whistle and twitter, and hens have a slight quack. Quite hardy—some birds stay as far north as open water is found. Flight is often low, erratic, with the entire flock twisting and turning as one unit. Green-winged teal are the only species of duck known to scratch in flight. Rarely dives for food, but will dive to avoid predators. Often perches at low levels above the water. Have overlapping territories with other males during the breeding season. Very gregarious during the winter months and are often found in flocks numbering in the hundreds.